Postcard from Ruggero Bacci, written in Italian, to his son Alfo Bacci, February 12, 1941. 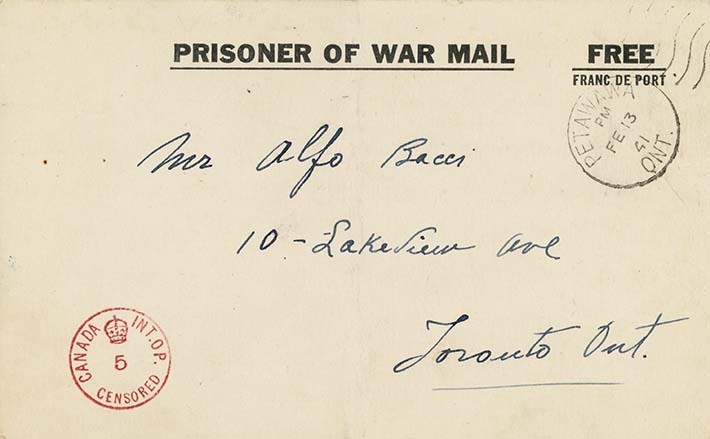 In this postcard to his youngest son Alfo, Bacci notes that he is able to receive mail from his family (as much as they want to send), but he is only able to send three letters and four postcards a month. Receiving mail was an important occasion for internees. For most, letters were the only contact they had with family. In addition to the limits Bacci notes, the maximum length for letters was twenty-four lines and eight lines for postcards. Exceptions were made for those who ran businesses and had to respond to letters from the Custodian of Enemy Property. All camp letters were read by a censor. Contents deemed inappropriate were blacked out with ink. The same applied to incoming mail. Camp letters that were written in Italian were first translated into English before being read by a censor.